Here is what I have been up to with my White Willmark cotton. Snowflakes! I have a great book called 100 snowflakes to crochet by Caitlin Sainio it is split into three sections from beginner to advanced, it has a lot of fabulous picot type designs and also a few that are more snowflakey themed motifs, rather than snowflakes, ( but I guess that is all open to personal opinion and interpretation). I've been playing around with some Picot patterns. For those who don't know what I mean a picot is defined as a loop or series of small loops often used to form a decorative edge in lace, embroidery, knitting and crochet. 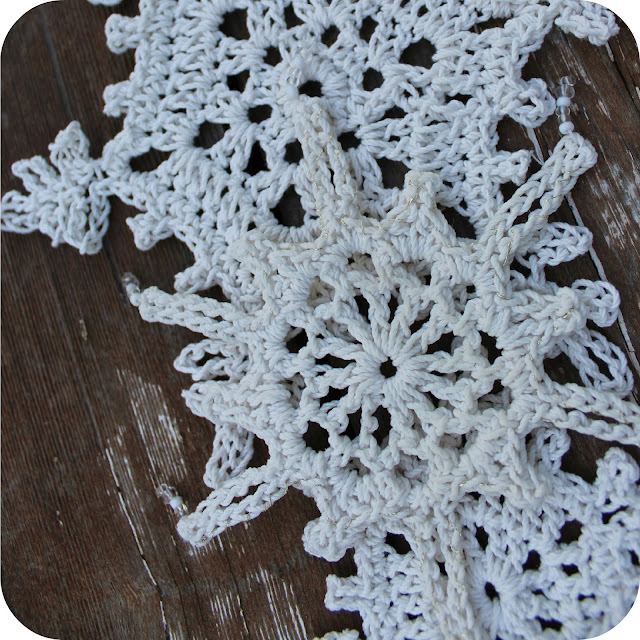 One of the things I really like about this book is that it has some great info and methods for blocking and stiffening your completed work which is of value for someone like me who this is new to, it also has tips for creating your own patterns.The biggest crochet snowflake you see here is Polaris from the advanced section. I elected to do these with Willmark cotton due to the structural qualities I mentioned yesterday, though in the many limbed and longer picot styles some additional assistance is needed to maintain the structural shape. I haven't done anything to the Polaris yet. The smaller snowflake in the left of the first image was wet and then blocked and left to dry, I only used water and it is holding its compact shape quite nicely. The snowflake with the very long arms was bathed in a heavily diluted commercial fabric stiffener from lincraft. It say at a guess I went about 60/40, water /stiffening product, I mixed it in an ice-cream container and let the crochet piece soak in it for a few minutes, then I removed it and used a pin to open up any areas that had filled with the gluey liquid. I blocked it and left it to dry in the sun. This method actually changed the colour of the snowflake slightly as can be seen in the image above. The discoloured snowflake is laying across the top of the other two and is a bit more cream. The rigidity is good, its not like concrete but has some flexibility left in it and the snowflake is still able to hold its arms out straight. This discolouration is not too awful but I thought needed to be mentioned. I went a little further in embellishing this one by giving it some dangling beaded tips and added a bit of extra bling by hand stitching a fine gold thread around and through the loops of the outer edge I love the subtle shine and shimmer it displays now. 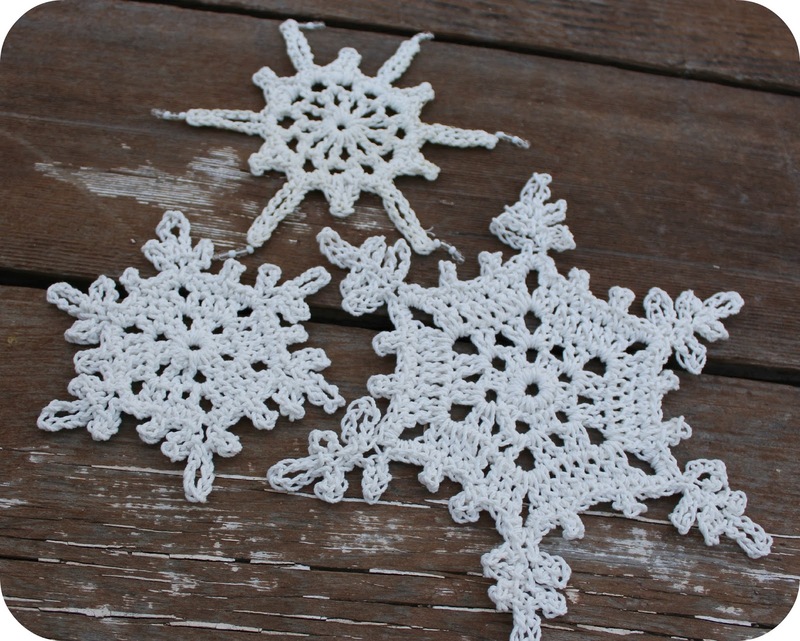 I'm a bit at odds making snowflakes for Christmas ornaments and decorations in the Australian Summer but they are pretty and used at Christmas time even thought it does not hold the same symbolic meaning for us as for those who celebrate Christmas in Winter! 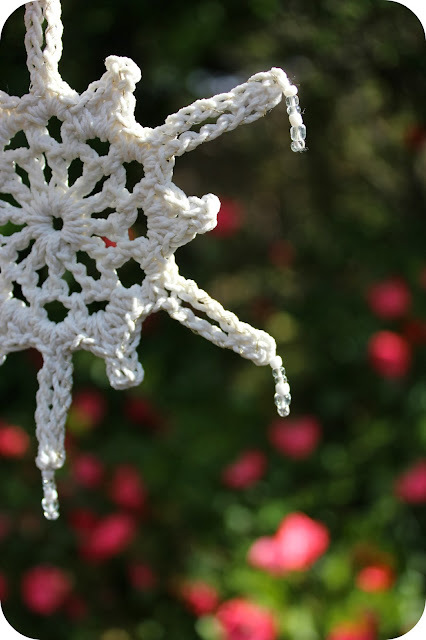 I'm thinking of crochet snowflake bunting and a table runner too but I'd like to play around with some different yarns for those ideas - there may be some on the way! Shhh. These are very pretty. I can crochet but stick to knitting. If I do crochet , it will be with a reasonable size hook and some thickish wool. My grandmother did the most amazing work with ultrafine thread. She was frustrated I could not look at her crochet, even coat hanger covers, and just follow what she had done. Thanks so much Jan! You always mange to comment with something I feel adds value here :) I'm so pleased that you visit. I'm having some fun beading and 'blinging' my other snowflakes now.